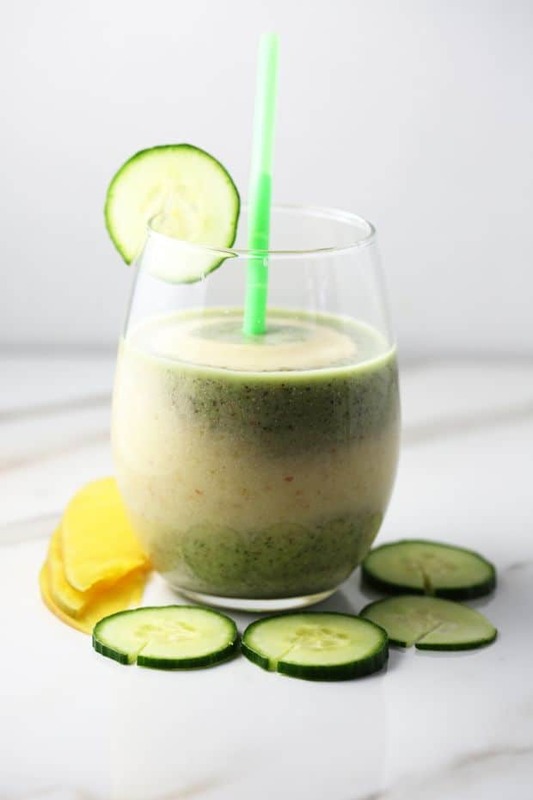 I know that a lot of us think that cucumber might not be a fantastic choice for the ideal smoothie but this Cucumber Mango Smoothie with coconut milk, and healthy Chia seeds is a powerful drink. Here are simple instructions on how to make mango smoothie! That’s only four ingredients people! 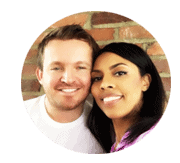 Such an easy list to work with and the outcome is simply fantastic. I think most challenging thing in this recipe is to know on how to cut a mango 🙂 and that’s about it. If you are looking for an easy healthy smoothie than look no further. This healthy mango smoothie requires only four ingredients! Perfect and powerful breakfast smoothie. If you are looking for more healthy smoothie recipes, please try our fabulous Kale Banana Smoothie recipe. Check out our super simple guide on how to cut a mango with a knife. 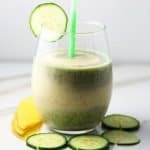 How to make a cucumber mango smoothie? Healthy and delicious Cucumber Mango Smoothie packed with powerful Chia seeds. Combine mango and coconut milk in the blender. Add one tablespoon of Thai kitchen unsweetened milk. Blend for 10-15 seconds and pour into the glass. 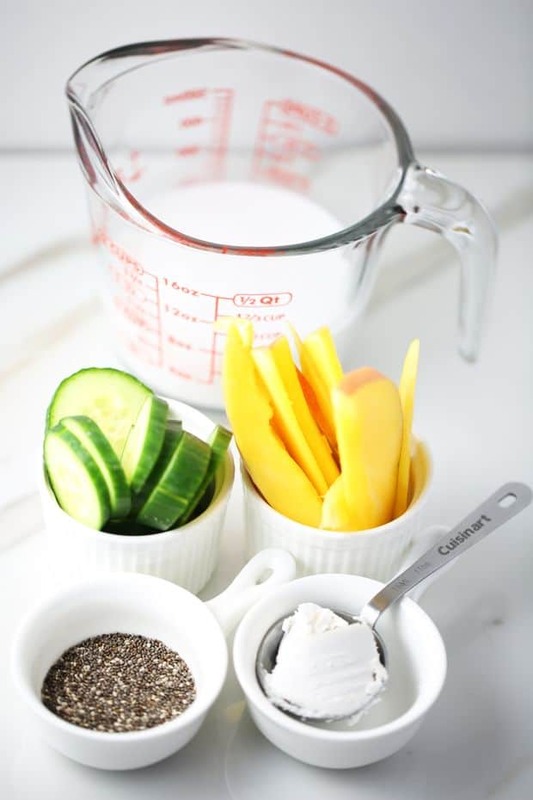 Combine cucumber, coconut milk and Chia seeds in the blender, pulse for 10-15 seconds. Pour into one glass, garnish with a cucumber slice. Enjoy! 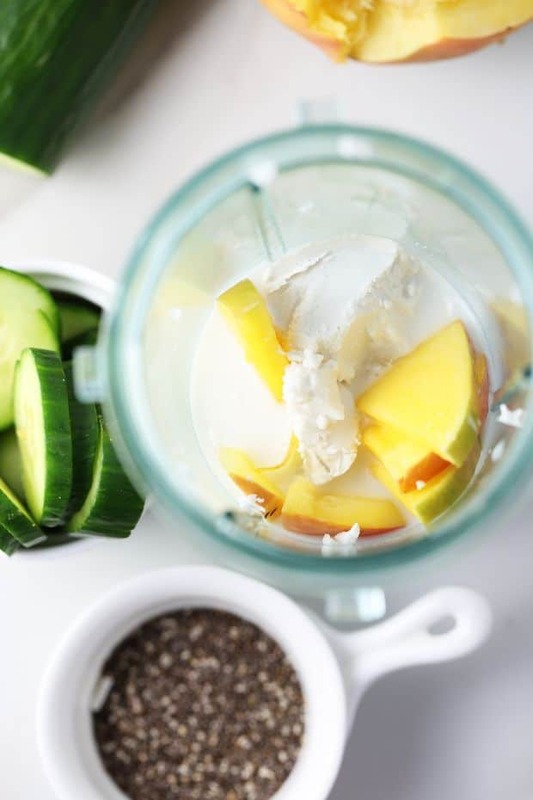 Love the idea of fresh cucumber combined with mango!